Coming off a dramatic 2-0 win over Australia in Canada’s opening match of the Rio 2016 Olympic Football tournament, Head Coach John Herdman’s youthful Canadian team is certain to be looking for a decisive win against Olympic newcomer Zimbabwe. When the players hit the pitch on Saturday, it’s likely more than just the Zimbabweans will be making their Olympic debut. After only one game, Canada has featured eight players making their first Olympic appearance, including goalkeeper Stephanie Labbe, Kadeisha Buchanan, Ashley Lawrence, Shelina Zadorsky, Jessie Fleming, Janine Beckie, Rebecca Quinn and Allysha Chapman. Canada’s team has an average age of 25 years old, and blends a mixture of youth with veterans like Christine Sinclair and Diana Matheson, who have long put their mark on Canadian soccer. 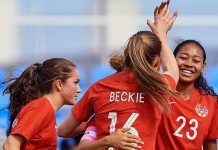 The make-up of Canada’s side is not a coincidence, but part of a larger plan with Canada Soccer’s Women’s EXCEL Program that was initiated in 2012. Canada’s player pipeline is getting stronger each year, but 2016 is a particularly important year as Canada plays in the Olympics as well as CONCACAF Girls’ Under-15 Championships (9-21 August), and the FIFA U-20 Women’s World Cup and FIFA U-17 Women’s World Cup later in the year.